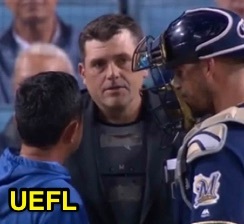 HP Umpire Brian Knight left five pitches into the bottom of the 1st inning of Friday evening's Brewers-Dodgers game after a foul ball off the mask staggered the plate umpire. With none out and none on, Dodgers lead-off batter Joc Pederson fouled a 93.3-mph 2-2 fastball from Brewers pitcher Corbin Burnes into Knight's traditional-style facemask. Dodgers public address announcer Todd Leitz described Knight's departure thusly: "HP Umpire Brian Knight will be leaving the game and assessed per concussion protocol. 2B Umpire Pat Hoberg will take over behind the plate when play resumes." 1B Umpire Jeremie Rehak and 3B Umpire Gerry Davis remained as the two field umpires. Relevant Injury History: Knight has a history of head injuries as a home plate umpire. Knight last left a game due to head injury during a 2018 Cleveland-LA Spring Training matchup. Related Post: Injury Scout - Brian Knight Out on Spring Training Foul Ball (2/28/18). On September 9, 2016, Knight left a Dodgers-Marlins game due to a ricocheted HBP to the mask. Related Post: Injury - Brian Knight Leaves After Double HBP (9/9/16). On April 18, 2015, Knight was struck in the mask by a fastball during a Phillies-Nationals game. Related Post: Plate Umpire Brian Knight Leaves Game on Pitch to Head (4/18/15).